A few years ago I wrote an essay called "Wicked Tuna: NGS Supports Killing These Majestic Beings" about the launch of a series about killing these sentient animals. I figured the series would run for one season and then be pulled in favor of something else that would be less brutal and more in line with good conservation practices. With much regret, I was wrong. The series continues, as does the horrific treatment of these amazing animals. In various trailers you can see (if you choose and can stand it) tuna obviously writhing around in pain as the commentator dispassionately talks about these sentient beings as mere unfeeling commodities. I am astounded that the National Geographic Society (NGS) would continue to air such a series given their commitment to a wide variety of conservation projects around the world along with their series of kid's magazines, books, and TV specials. 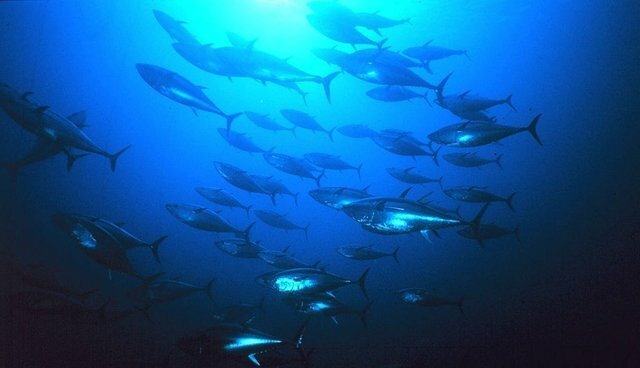 The NGS also notes, "The Atlantic bluefin tuna is one of the largest, fastest, and most gorgeously colored of all the world's fishes" and also "bluefin meat also happens to be regarded as surpassingly delicious, particularly among sashimi eaters, and overfishing throughout their range has driven their numbers to critically low levels." An update on the status of these fish can be seen here. "A review of the evidence for pain perception strongly suggests that fish experience pain in a manner similar to the rest of the vertebrates. Although scientists cannot provide a definitive answer on the level of consciousness for any non-human vertebrate, the extensive evidence of fish behavioural and cognitive sophistication and pain perception suggests that best practice would be to lend fish the same level of protection as any other vertebrate." Why are the tuna wicked? There is no doubt that tuna feel pain, and there also is no doubt that the title of the series is incredibly misleading hype, but this type of sensationalism sells. Why are the tuna wicked? What did they do to deserve this negative label, suggesting that they're evil? Clearly it's meant to make the tuna seem like the villain in this one-sided massacre. Why are they the evil ones? I fully know that people's livelihood depends on killing these and other animals, but that doesn't mean that NGS has to glorify this horrific practice nor that their series should continue. By airing this series they are playing a direct role in animal abuse and poor conservation practices that buy into the anthropocentric, narrow-minded, short-sighted, and arrogant notion that conservation is all about us (please see "New Conservation Science is Misguided and Too Much About Us"). Conservation isn't all about us nor should it be. I also would expect NGS to follow the guidelines of compassionate conservation (please see "Compassionate Conservation: More than 'Welfarism Gone Wild'"), especially "First do no harm." I encourage you to write to National Geographic to let them know that by showing these amazing beings writhing in pain as they're caught and sliced up for unneeded meals and encouraging poor conservation practices they are sending the wrong message to youngsters by supporting inhumane education, misrepresenting these animals as unfeeling commodities (please see "Animals in the Media: Guidelines for Accurate Representation"), and are not acting in the spirit of what NGS is supposed to stand for.